There will be three shows at St Thomas the Apostle Church in Heptonstall from Thursday 28th February to Saturday March 2nd and a fourth show at Halifax Minster on March 9th. There is promotional film about the play and the battle itself here. Colonel Sir Thomas Rainsborough, Leveller and MP for Droitwich, The Putney Debates 1647. Tickets at £10 are available through Eventbrite. Before the play is launched there will be a public lecture about these events on Monday 4 February, 7:00pm at The Waterfront Hall, Hebden Bridge Town Hall with local speakers and the playwright and director. Tickets are just £6. 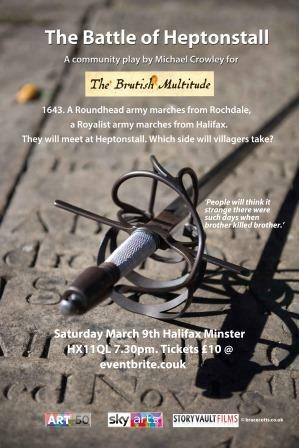 This entry was posted in Events, Feb, Mar and tagged Heptonstall.